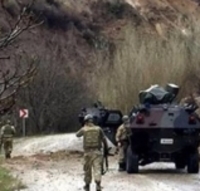 As a result of the explosion of an improvised explosive device (IED), a soldier has lost his life in Cudi, Şırnak province. An operation named "Martyr Gendarmerie Captain Yunus Çelebi," was conducted around the Cudi Mountain area in Silopi district, the Demirören News Agency reported. During the operation, an IED that was set up by the Kurdistan Workers Party (PKK) exploded at around 05.30 a.m. Gendarmerie Sergeant Burçin Damacı from the Cizre Public Order Commando Division Command lost his life. Damcı's family in Altınordu district in Ordu province was informed about his death in a visit to their home by Altıordu District Governor Niyazi Erten and military officials. Burçin Damcı was 29 years old and single.